Oh, come on, you can't just throw some chocolate ice cream into a cocktail shaker, add booze and call it a day! Uh uh, no way, nope. 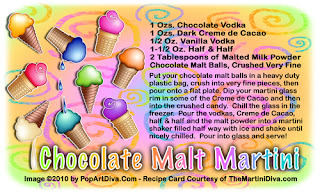 Let's take National Chocolate Ice Cream Day up a notch and celebrate with my Chocolate Malt Martini! It's a good day when you get to celebrate chocolate and ice cream . . . and martinis!